job by viewing some samples our most popular freelance job searches here. Freelancers registered with Freelance Services include: Graphic Designers, Art Workers, Photographers, Copywriters (web and print) , Flash Animators, Account Handlers, Marketing and PR Consultants, Project Managers, Web Designers and Web Developers. Create your personal portfolio page on Freelance Services. Companies will be able to view examples of your work, details of projects you have worked on and testimonials from your clients. Creative Freelancers available when you need them - hassle free! The online diary service and searchable database of creative freelancers - instant FREE access to the best pool of creative talent in your area. 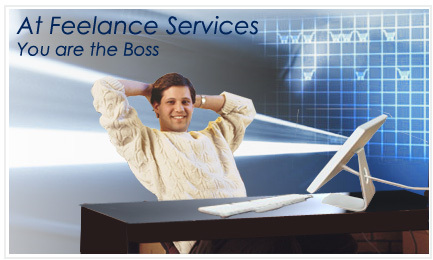 Use Freelance Services to manage your pool of ‘favourite’ freelancers. Find out who’s available for your next project in just a few clicks.